I used lacinato (or dino) kale because I really like the texture and appearance. I find the flat leaves a little easier to work with than curly kale and once cooked the appearance kind of reminds me of glossy seaweed. If you can’t get lacinato kale or the curly kind is a bit cheaper, it really does work just as well as lacinato, so use whatever works for you. 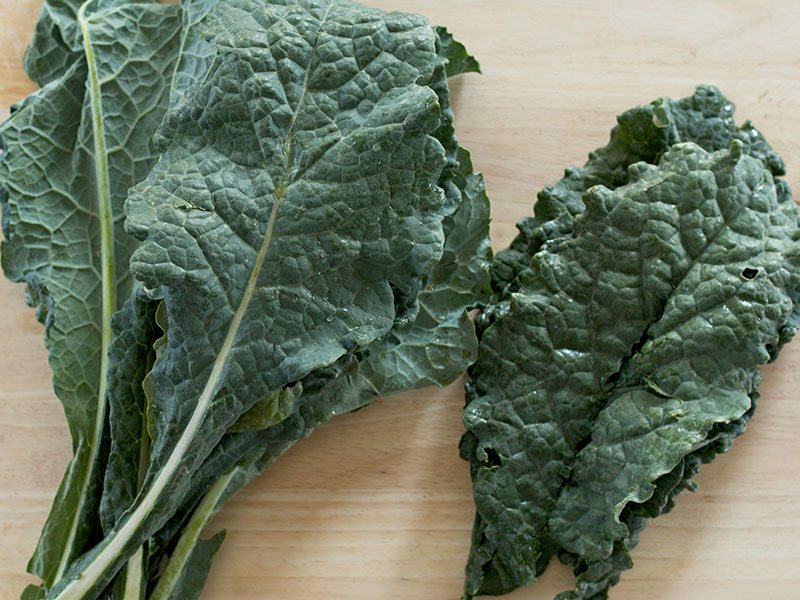 Remove the woody stems from the kale leaves either by slicing down each side with a sharp knife, or by pinching the leaf at the base and pulling out toward the tip. Stack the leaves and then slice crosswise into one inch wide strips. Wash the leaves well in a colander with cool running water. 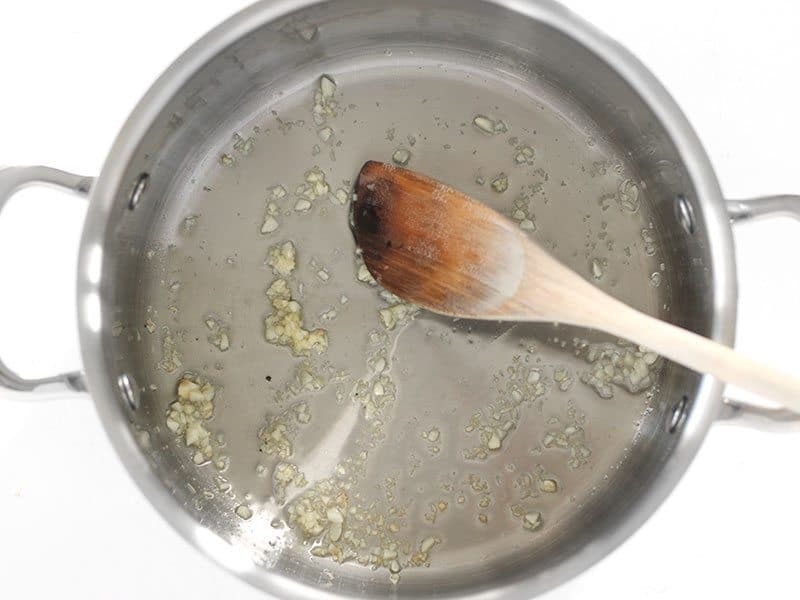 Mince the of garlic and add it to a large pot with one tablespoon of neutral cooking oil (or your favorite cooking oil). Sauté the garlic for about one minute over medium heat. Add the washed kale leaves to the pot. 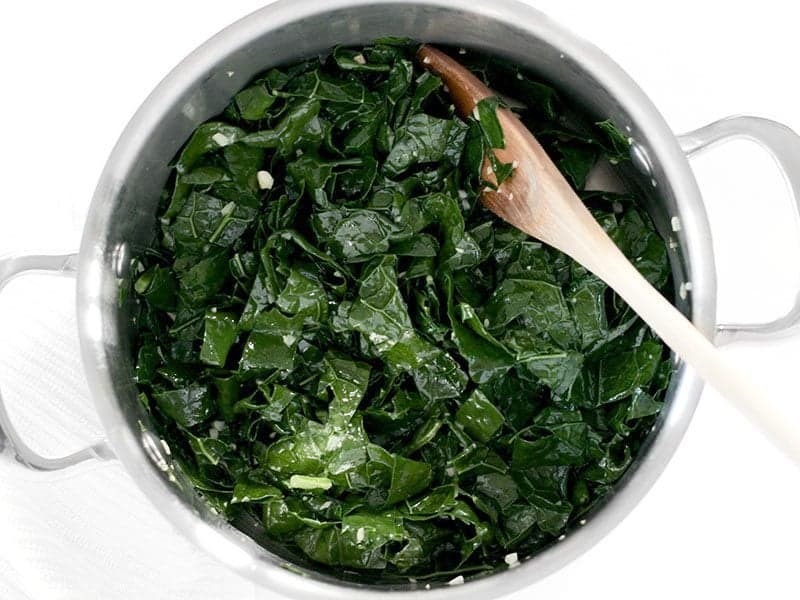 Stir and cook the kale until it is wilted and glossy (about 5 minutes). If you prefer a more tender leaf, cook longer. Add the soy sauce, toasted sesame oil, and sesame seeds to the pot. Stir to coat. Taste and adjust the seasoning to your liking. Serve warm. 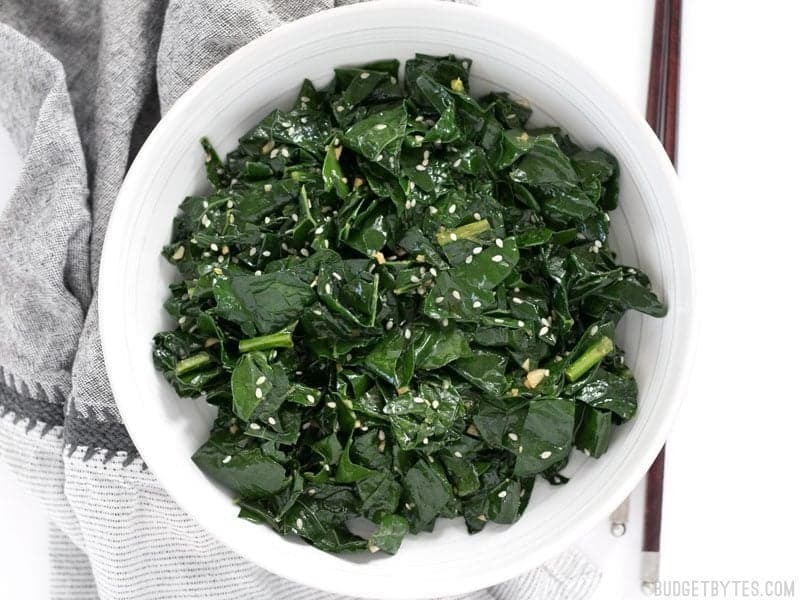 Start with one bunch of kale. I like to use lacinato kale because I find it easier to work with. Remove the stems either with a knife, or by holding the base in one hand, pinching near the base with the other hand and sliding it down toward the tip. The pinched fingers will pull the leaves from the stem and then the stem will naturally break where it becomes tender. Once the stems are removed, stack the leaves and then slice them crosswise into one-inch wide strips. 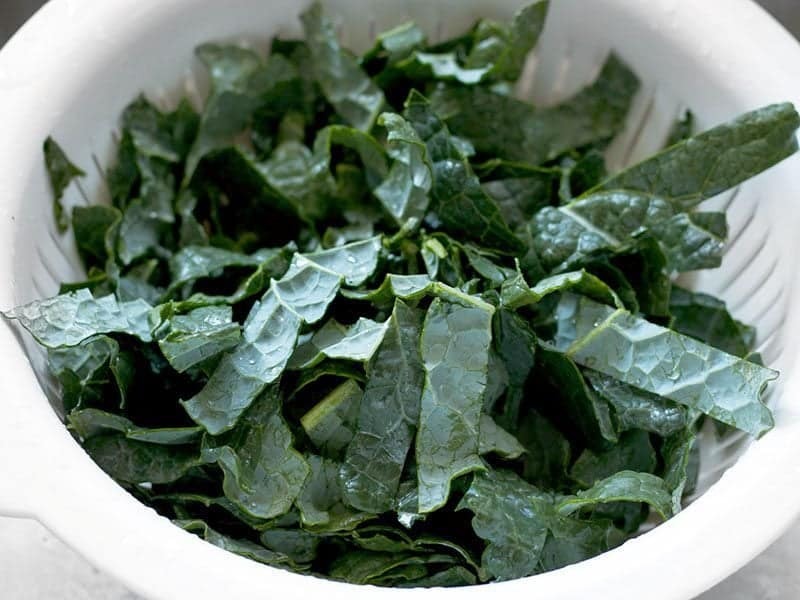 Wash the kale leaves well with cool water in a colander. Mince two cloves of garlic and sauté them for about one minute in a large pot over medium heat with one tablespoon of your favorite cooking oil. Add the washed kale to the pot. Continue to stir and cook until the kale is wilted and glossy. I like my kale to still have a bit of body and chew to it, so I only cook for about 5 minutes. If you like it softer, cook longer. Finally, add 1 Tbsp soy sauce, 1 tsp toasted sesame oil, and 1 Tsp sesame seeds to the pot. Stir to coat the kale. Taste and adjust any of the seasonings to your liking, then serve. 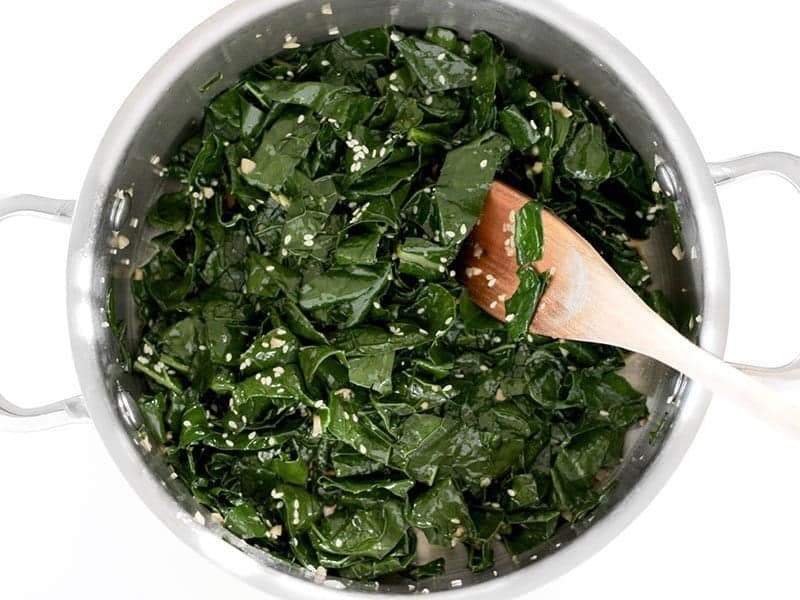 You can also add some red pepper flakes if you like things spicy, or a touch of honey if you prefer to soften the bitter flavor of the greens. This is the toasted sesame oil that I used. The bottle doesn’t specifically say “toasted” but you can tell that it is toasted by the dark amber color. Regular sesame oil is a light straw color, like canola. 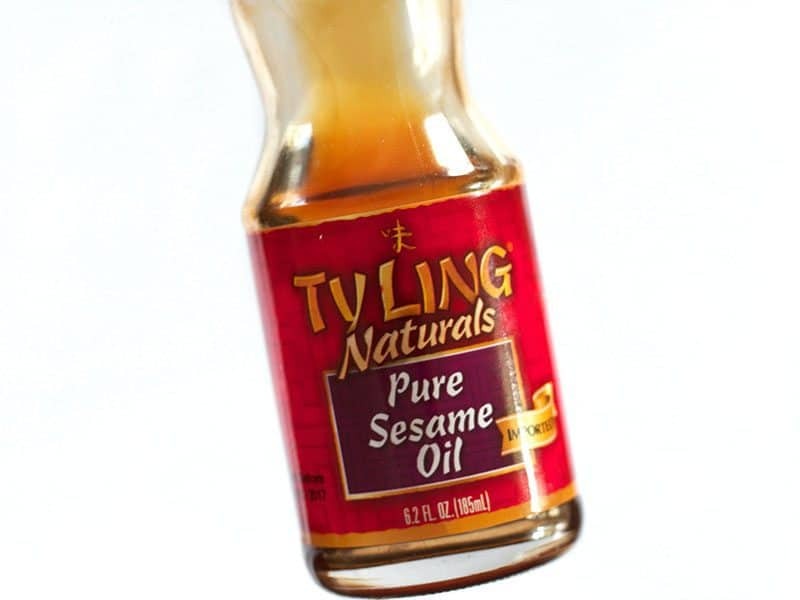 Toasted sesame oil has a MUCH stronger nutty flavor. It’s more expensive, but because it’s so potent you only need a little to make a big difference, so one small bottle like this will last a long time. I really loved this recipe! I’m a little meh about kale. have only tried it a few ways so far and I’m glad I have this easy recipe now too! We tend to buy a big bag of kale when we get it because it’s cheaper, but we usually end up wasting a lot of it so I’m glad I can use this to quickly cook up what’s left over. Our kale was really curly, but I’ll have to look for the flatter kind you made it with sometime. Thanks for another winner! Made this tonight to go along some turmeric meatballs and chickpeas that I roasted, tasted great and was the perfect side dish, will try it again with some Thai Chicken Meatballs & Sesame Noodles that I make in the summer. 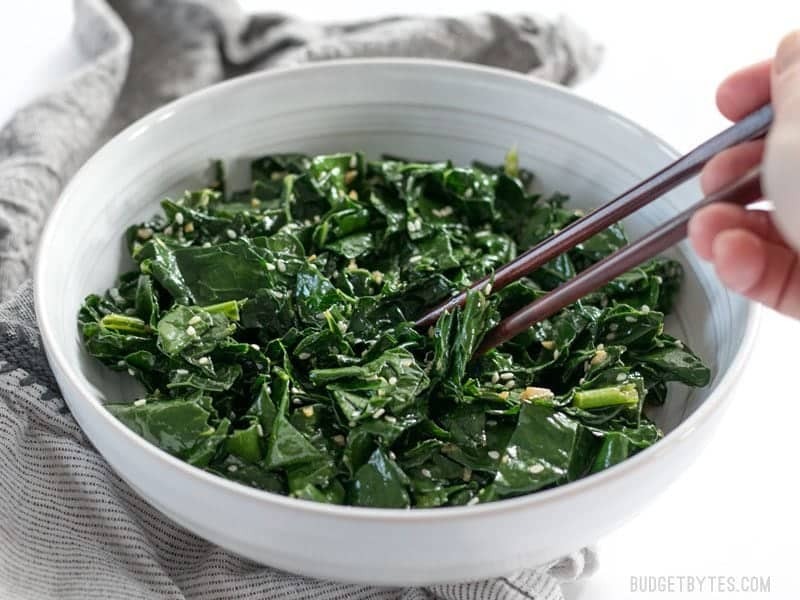 I love new ways to change up kale! Great recipe. I just made and ate this. Super easy and delicious! My daughter in law made this for us last week when we went to their house for dinner. It was delicious! My taste buds crave to enjoy it again soon. So she emailed me the link to the recipe. 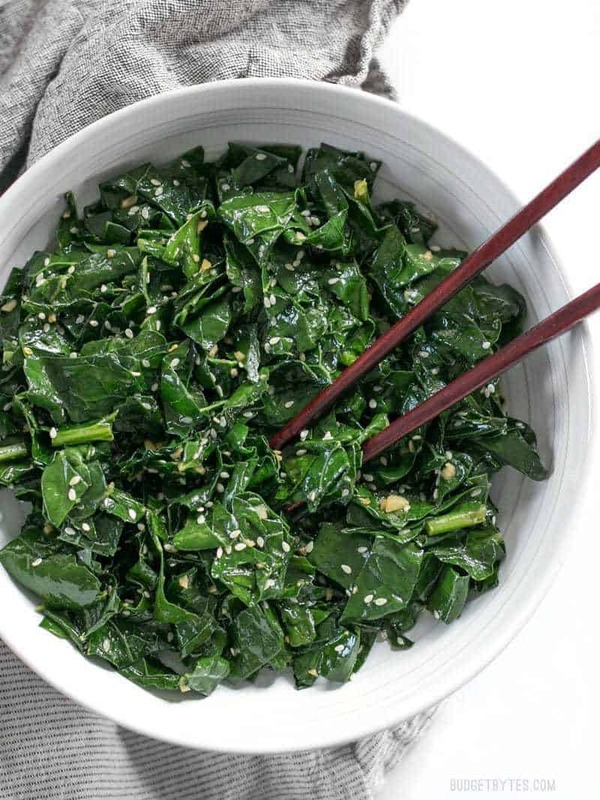 The sesame oil and garlic were the perfect compliment to the kale. Thank you! This was super easy and so yummy. We used kale from our garden abd we ate it with sweet and sour chicken and rice.